This is a mural on the campus of the American University of Afghanistan. On the evening of Aug. 24, 2016, as the sound of explosions and gunfire filled the air on campus at the American University of Afghanistan, freshman Zakira Rasooli had only one thought: What would become of her mother if she died in the attack? "My mother would not live," she says, "because everyone in the family will blame her because she sent me [here]. She wanted me to reach my dreams." Rasooli’s father had passed away a couple of years before, and it was her mother who decided to send her to study political science at the American University in Kabul. That’s about 300 miles away from home, in Kandahar. Having an 18-year-old woman go to school in Kabul, by herself, was unheard of in Rasooli’s family. "She stood against all those ideas that our relatives had," Rasooli says of her mother. As the gunshots rang out in the university hallways, Rasooli felt paralyzed. She had only arrived on campus five days before. Then, her phone rang. "My mother called me because our relatives had heard about the attack," she recalls. "I went to the washroom. I closed the door so that they [wouldn't] hear the firing sound." Rasooli tried to stay calm. She told her mom everything was fine and that the attack happened on the streets outside the university. It's one of the very few times that Rasooli has lied to her mom. But she knew the truth was too unbearable. "[I told her] 'don’t listen to anyone. Don’t listen to the news.' Although I was so little, I don’t know where I got the courage." After she hung up, Rasooli darted toward the basement, trying to hide from the gunmen. There, she found other students also seeking cover, most of them in shock. Some had jumped from the upper floors and broken bones. "Everyone was crying there. We were still hearing the fires, and we knew that our friends [were] dying." The attack on the American University lasted for nine hours. By the time it was all over at 4 a.m., more than a dozen people were killed. Among them were students, police officers, security guards and a doorman. Two years later, the university looks more like a military compound than a campus. Tall, concrete walls, topped with barbed wire, surround the entire campus. Armed guards stand in watch towers, keeping a close eye on the entrance. On a visit last spring, armed men in bulletproof vests and reflective sunglasses motion for me and my producer to go inside a trailer for a security search. Security was beefed up after the Taliban attacked the school in 2016. I ask the smiling woman vigorously patting us down if these security checks are for everyone. "Oh, yes," she says, adding, "No one sets foot on this campus unless they complete these searches." About an hour of passing through various security checks and three head-to-toe body searches later, we are allowed in. The American University of Afghanistan, which was founded in 2004, is mostly funded by the US Agency for International Development, and subsidized by American taxpayers. 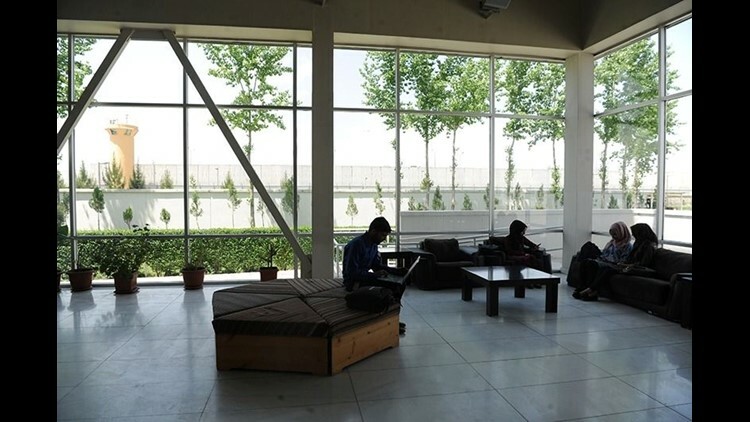 It is the first private institution for higher education in Afghanistan, and the idea behind it is to bring an American-style education to Afghans. Rasooli, the woman who survived the 2016 attack, introduces us to her college friends and shows us around her dorm. It's a brand-new building that opened its doors just three months before our visit in March. The price tag: $4.1 million. The dorm walls are freshly painted and the gym and kitchen look barely used. There are typically three or four people to each room, the students tell us. Rasooli's has two beds. We sit on the colorful carpet to talk with them. Rasooli is from Kandahar; Parwen Samar is from Bamian; Masooma Kohandil is from Kabul; and Samaneh Nasiri, the most outspoken of the group, hails from Herat. 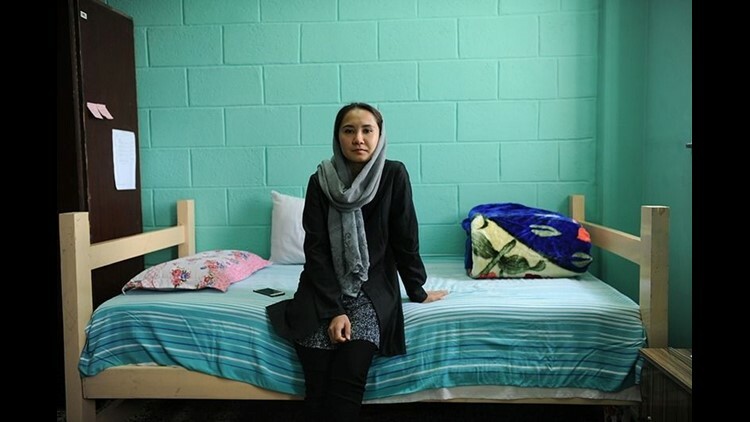 Samaneh Nasiri, a student at the American University of Afghanistan, sits in her dorm room. Nasiri survived an attack on the school in 2016. Parwen Samar studies law at the American University of Afghanistan. What we are witnessing today would have been impossible three decades ago in Afghanistan. When the Taliban rose to power, it banned education for girls and women. The impact on women's education was disastrous. Literacy rates in Afghanistan dropped significantly. Today, it's one of the lowest in the world — only 19 percent among adult women. The students say that as a result of the ban and years of civil war, their mothers never got any formal education. But the US invasion in 2001 toppled the Taliban. That's when these students' mothers saw an opportunity. They wanted their daughters to be educated and financially independent — to have what they could not. "My mom has [a 12th-grade] education," says Nasiri. "Because of civil war, because of Taliban attacks, she couldn’t continue her education. That’s why she’s motivating me, [saying] 'you should get higher education and you should be successful.'" "My mom is illiterate, too," explains Nasiri, "but she is amazingly open-minded. Unlike other families, she let me come and study here." It costs about $1,000 a year to enroll in this university. That’s in a country where the average monthly income for a household is between $165 and $215. No group has officially taken responsibility for the 2016 attack on the American University. But it's widely believed that the Taliban was behind it, though ISIS is also a suspect. The American University is a target because of its connection to Westerners, the students explain. After all, it has "American" in the title. Only a few weeks before the attack on the school, the Taliban abducted two of its professors, Timothy Weeks, an Australian, and Kevin King, an American, at gunpoint in Kabul. Later, it released a video, demanding that insurgent prisoners be released in exchange for the professors' freedom. The Navy SEALs attempted to rescue Weeks and King but the mission failed. Nasiri explains that after the school attack, she had a hard time sleeping at night. "For one week, every night, it was like a movie repeating [in my head]." Even if she did manage to get a few hours of sleep, she woke up with nightmares about that horrible night. Exercise helped her heal, though, and she says she's doing much better now. With all of the security in place at the school now, though, the students stay remain on campus for weeks on end. They say it feels safer here than to leave. "I only leave for a few hours every two to three weeks to buy something, and then I come back as soon as possible," says Parwen Samer, the law student. It helps that food and other necessities are provided for them. 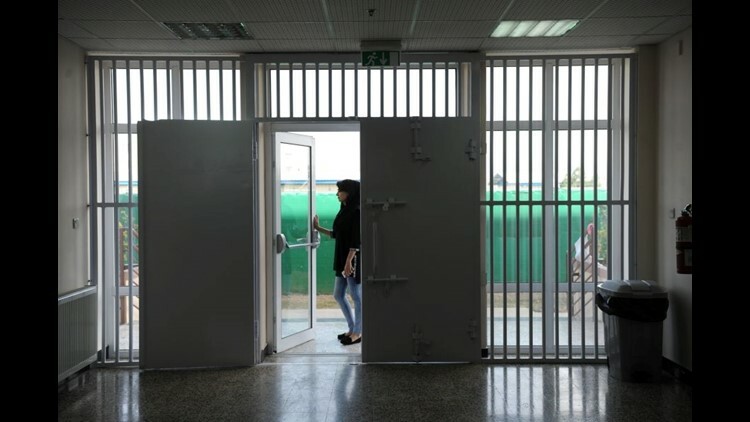 But inside these metal gates, and despite the limitations, these young women have created a sort of sisterhood. Students on campus at the American University of Afghanistan. "We have dance parties, we have tea talks and we have movie nights as well," says Masoumeh Kohandil, with a giggle. "What’s a popular movie among the girls here?" I want to know. "Mostly Bollywood and horror movies," they all respond, talking over each other. The students say they know that mass shootings are also a big problem in the US. "It's weird how attacks could happen there," says Rasooli, "but it happens. I know that they [Americans] also have this problem." For these students, just being here is an achievement. It’s a show of defiance and determination. Each of them says they will go back to their provinces when they graduate. Nasiri plans to start her own business. Samar wants to become a lawyer. And Rasooli sees herself going into politics “because I know Afghanistan needs politicians, I mean smart politicians, more than ever." 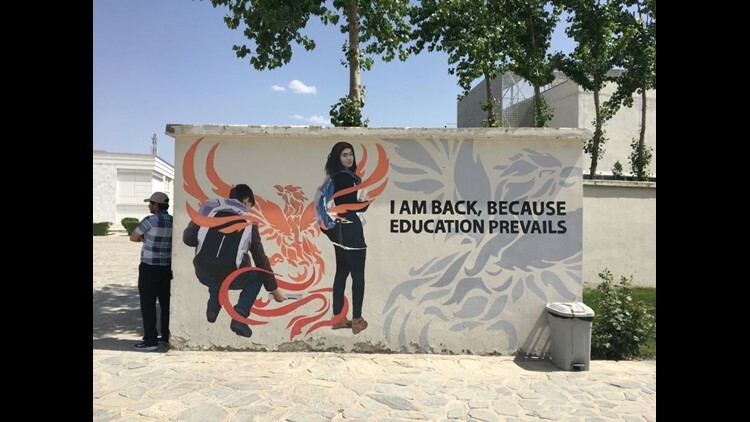 We say goodbye to the students and pass by a mural of two backpack-carrying students.